Obama: "Economy that is already in crisis will be faced with catastrophe"
WILLIAMSBURG, Virginia (CNN) -- President Barack Obama said Thursday that "the scale and the scope" of his economic plan is right, turning up the heat on critics he said were hawking "phony arguments" and "false theories of the past" to chip away at the bill's programs. 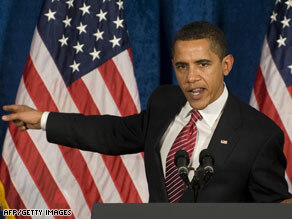 President Obama said if a stimulus bill isn't passed the economy will continue to get worse. "Don't come to the table with the same tired arguments and worn ideas that helped to create this crisis," the president said at the House Democrats' annual retreat in Williamsburg. "We're not going to get relief by turning back to the very same policies that, for the last eight years, doubled the national debt and threw our economy into a tailspin," he said. "We can't embrace the losing formula that says only tax cuts will work for every problem we face, that ignores critical challenges like our addiction to foreign oil, or the soaring cost of health care, or failing schools and crumbling bridges and roads and levees. "I don't care whether you're driving a hybrid or an SUV -- if you're headed for a cliff, you've got to change direction." The Democrats welcomed the president with frequent interruptions for applause as he took on criticisms of the bill. Obama said he valued "the constructive criticism and healthy debate that's taking place around this package," but added that speedy passage of the bill was essential. "We're not moving quickly because we're trying to jam something down people's throats," he said. "We're moving quickly because if we don't, the economy's going to keep getting worse." Time: Can Obama regain control of stimulus? Obama rejected calls for more tax cuts and significant slashing of the bill's more than $800 billion price tag, and said complaints the package was a spending bill rather than a stimulus bill were off base. "What do you think a stimulus bill is?" he said. "That's the point." To critics who argue that the government shouldn't be spending billions with a large and growing deficit, Obama said, "I found this national debt doubled, wrapped in a big bow waiting for me as I stepped into the Oval Office." The American people called for change in November, he said, "and that's what we're going to deliver." "They did not send us here to get bogged down with the same old delay, the same old distractions, the same talking points, the same cable chatter," he said. "They did not vote for the false theories of the past, and they didn't vote for phony arguments and petty politics, and they did not vote for the status quo." Obama told his fellow Democrats that they have "the capacity to do great things" on behalf of the American people, "but we are going to have to do it by not thinking about ourselves." "It starts with this economic recovery plan," he said. "And soon, we will take on big issues like addressing the foreclosure problem, passing a budget, tackling our fiscal problems, fixing our financial regulation and securing our country." But, he stressed, the battle over the stimulus bill is not "an abstract debate." "If we do not move swiftly to sign [the act] into law, an economy that is already in crisis will be faced with catastrophe," he said. "This is not my assessment. This is not Nancy Pelosi's assessment. This is the assessment of the best economists in the country. This is the assessment of some of the former advisers of some of the same folks who are making these criticisms right now." "This is not a game," he said. "This is not a contest for who's in power and who's up and who's down." It's time, he said, to "set aside the gamesmanship in this town and get something done." Behind closed doors after his speech, Obama fielded a handful of questions from House Democrats. Asked about Afghanistan, Obama pointed to a number of reviews under way -- including ones by his national security team and by the U.S. Central Command -- of U.S. strategy in Afghanistan. The United States cannot win there by military means alone, Obama said. He stressed the need to make sure that Afghanistan does not become a safe haven for terrorists. The president highlighted the importance of diplomatic efforts in Pakistan as well. On the subject of fiscal discipline, Obama referred to the economic stimulus package, getting credit going again so small businesses can get loans, stemming home foreclosures with next expenditure of the Troubled Assets Relief Program, and the executive compensation limits his administration set this week for businesses that accept taxpayer bailouts. Asked whether he would lift the ban on stem cell research, the president promised to sign an executive order to do so. Obama said he wants to coordinate with House and Senate leadership to craft an executive order - based on science, fact and reason -- strong enough to avoid a quick reversal. Obama's comments impressed Rep. Charlie Melancon, D-Louisiana. The president "said he'd rather do what's right and serve one term than just do what's politically good and be a mediocre president and get to serve two terms," Melancon said. Melancon, a fiscal conservative, said he didn't support every program in the House bill. "We couldn't explain some of them," he said. For instance, "how does giving out condoms put people back to work?" But Melancon criticized Republicans who focused on only a small fraction of the stimulus bill, calling it "chump change." He acknowledged that although a stimulus package might not work, he said Congress needs to act or risk "total collapse" of the economy. House Majority Leader Steny Hoyer of Maryland praised Republicans who voted with Democrats and said they showed true bipartisanship. But he railed against the Republican leadership, which told its members to vote against the original stimulus bill. "Now they seem to be fired up and ready to say 'no,' Hoyer said. "We hope that they will change their minds." Republicans have blasted numerous measures in the $819 billion stimulus package that the House passed last week, such as funding for veterans in the Philippines, sod on the National Mall and honey bee insurance. Such provisions have nothing to do with stimulating the economy, Republicans say. Hoyer acknowledged a need for compromise on some points important to the Democrat leadership, but he declined to specify what he'd be willing to sacrifice to get the bill passed. CNN's Brianna Keilar, Emily Sherman and Deirdre Walsh contributed to this report.